Whilst concentrating on architecture and engineering, sometimes smaller details such as these were a distraction to be occasionally indulged: this set dates from 2011 and 2012. 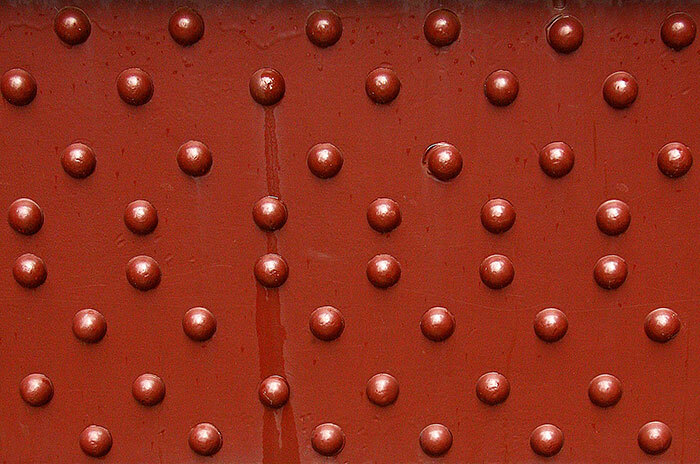 Here, domed rivets join steel plates cut and assembled to form the 1962 Dearborn Street Bridge. Their dense pattern and the pristine paint appealed. Its rich red hue recreates the colour of a much earlier mixture of red lead paint and black powder.
. The single bascule span Wells Street Bridge of 1922 carries a road on its lower deck and the L railroad on the upper. In this 2011 image it seems overdue for restoration work to match the finish depicted in Image 1. I angled the camera to place the peeling line of rust ruptured paint on to the diagonal without registering it would have an equal effect on the perpendicular water trails. Weathering paint crazes, cracks, flakes and peels protection away to expose the supporting surface to its own variety of decay. 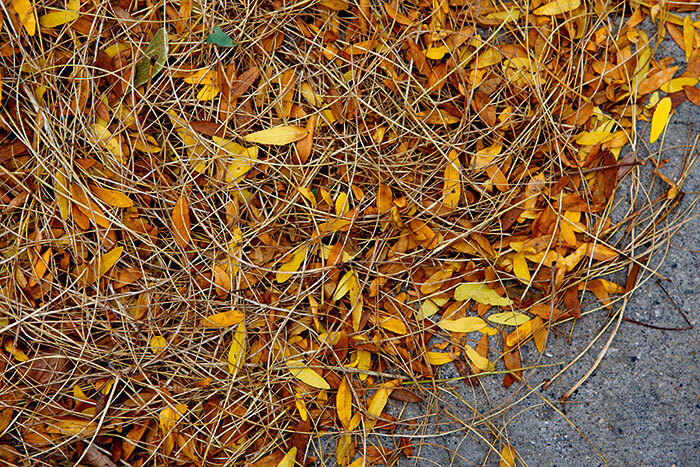 An autumn morning breeze was swirling leaves into the corners on staircase steps close by Michigan Avenue Bridge. Minutes after exposure a street vacuum cleaner cleared them away but successors soon drifted in. The moment of concentration with the camera seemed to add clarity to the gentle rustle of leaves moving over stone. 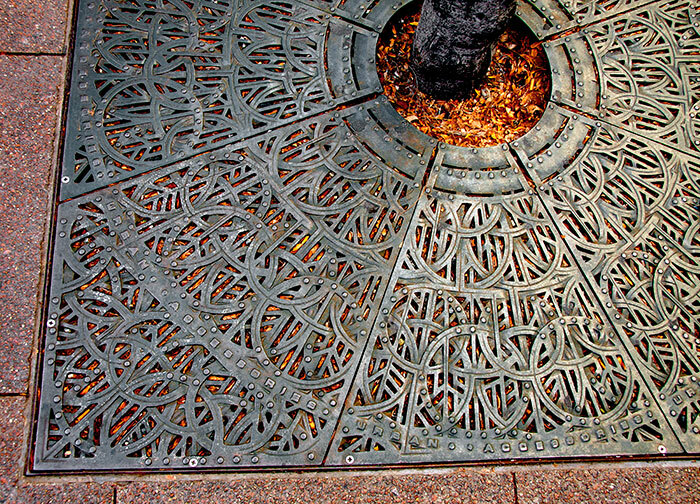 This cast iron grille design covers the roots of a young tree planted in the small Pritzker Park by the Central Library at State and Van Buren. The subtle variations in design and the cast iron mellowed by weather and the polishing of shoe leather suggested a revival of an existing ‘on the street floor’ photography theme begun some time ago. 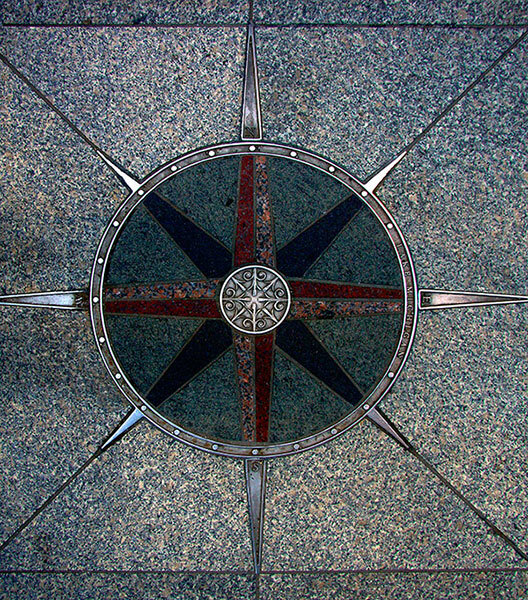 A metal compass star set into stone on the La Salle Street sidewalk also directs walkers to Lake Michigan along Madison Street. The camera lens lacked width and my tall stature was still too short to capture the whole square, borders and all. The more mundane concrete slabs top and bottom have been cropped out. The CHICAGO BRIDGES gallery contains black and white photographs concentrating on the bridge tender crew houses flanking the many bridges across the Chicago River. From them the operators work the machinery to open and close the bridges to large river traffic. 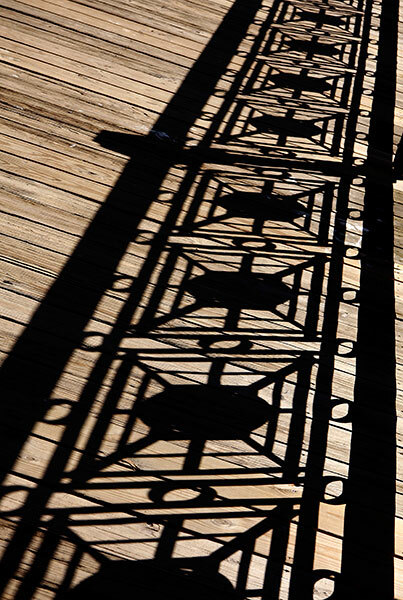 Here, I liked the strong perspective shadow cast across the structure’s timber planked sidewalk by the Franklin Street Bridge railings. 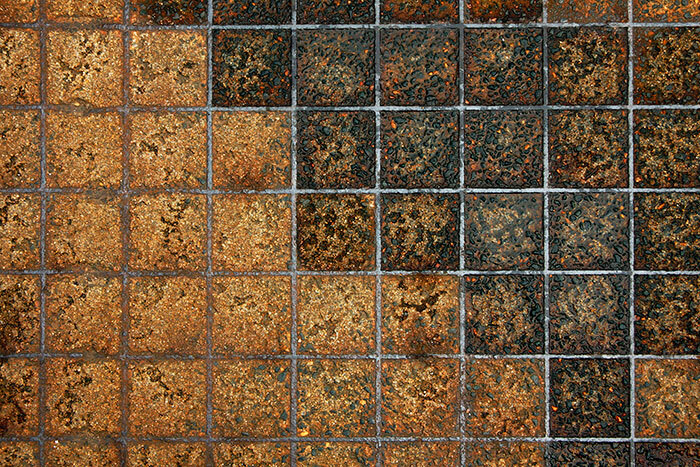 The bridge’s steel and concrete sidewalk was rust-stained, weathered and in strong visual contrast to the previous image. I liked the formal yet accidental division into light and dark areas on the grid. The first few hours after dawn offered almost deserted streets in which to work in subtle light to make images such as this enrichment of colour created by overnight rain. 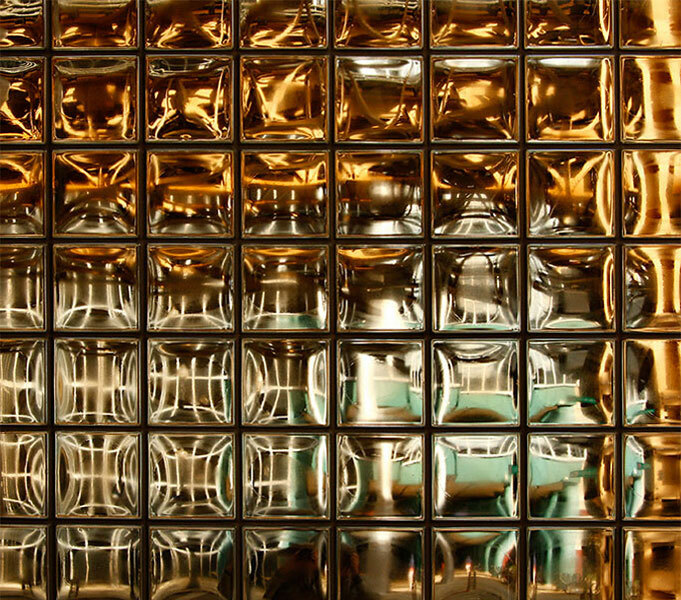 This reflecting panel of clear glass bricks is set into a corner of the Chicago Board of Exchange building at La Salle and Van Buren. At the time I doubt that I made a conscious connection between the colour and pattern here and those in the previous image. Here, the thick glass bricks act as lenses to diffuse light and create patterned distortions and reflections from the streetscape. 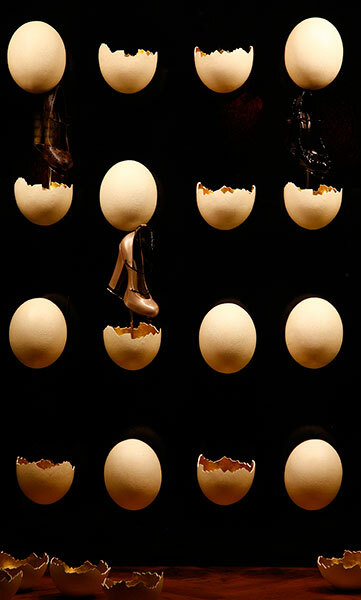 The eggs in this store display may look convincing but the matching serrations on some of them state otherwise. 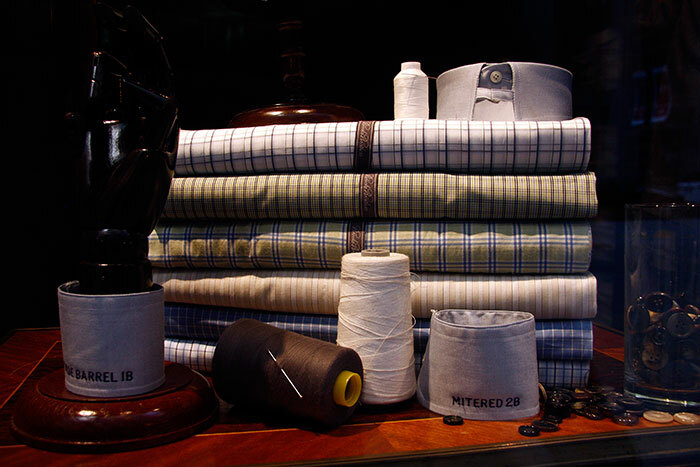 Window dressing is a potentially creative art form conveniently set into a ready-made frame. Here, this idiosyncratic designer assemblage supports commodity sales for money. Moved into an art gallery context would it attract the sometimes high-flown language of art criticism seeking to explain an intellectual significance? I’d been taking street photographs of The Rookery building completed in 1888 to the designs of Burnham & Root. An outfitters’ store occupied part of it and after recording some of the structure’s carved stone I added images from a series of sidewalk window displays. Beautiful clothing somewhat out of my league was displayed and illuminated with style. This still life group with bolts of cloth and sewing accessories promoted a bespoke tailoring service. 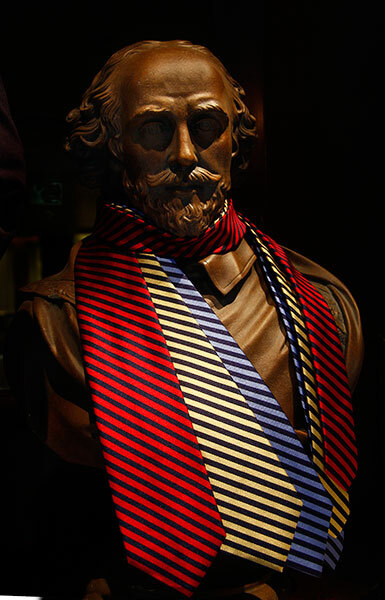 The three brightly striped neckties casually worn by a bronzed portrait bust in a second window attracted attention. Some after-dark shop window images are in the MICHIGAN AVENUE PORTRAITS gallery. 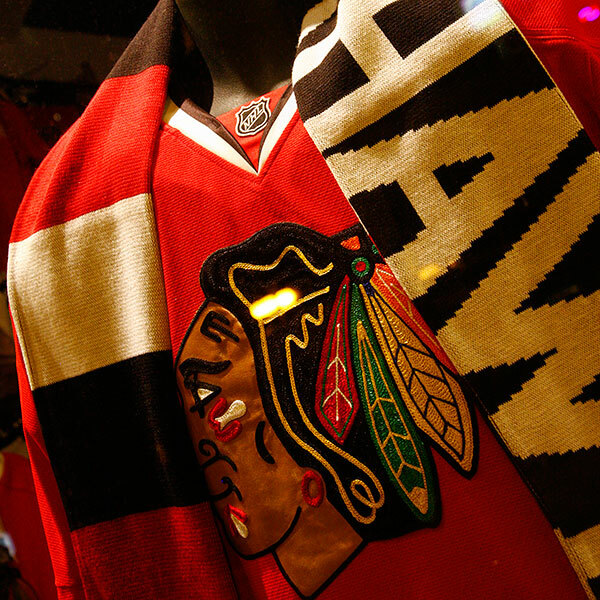 A detail from one of the window displays in the Chicago Blackhawks’ store on Michigan Avenue. The warm and colourful clothing seems appropriate wear for ice hockey fans watching play in the National Hockey League. The fragment of bold lettering fitted a long running photographic theme backed by bold shapes and strong colour. 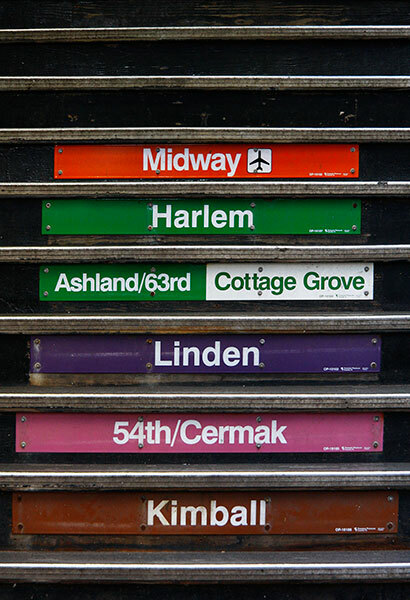 By colour, these stair signs indicate the lines serving a particular station and the ultimate destination of each on the L. Riding trains on Chicago’s elevated railway is a great way to view the downtown architecture from other than a street perspective and for exploring further afield. Boarding the Brown Line from Kimball at Merchandise Mart provides a closed circuit of the Loop calling at nine stations including this one at Madison and Wabash. The Chicago Symphony Center on Michigan Avenue is home to the Chicago Symphony Orchestra. 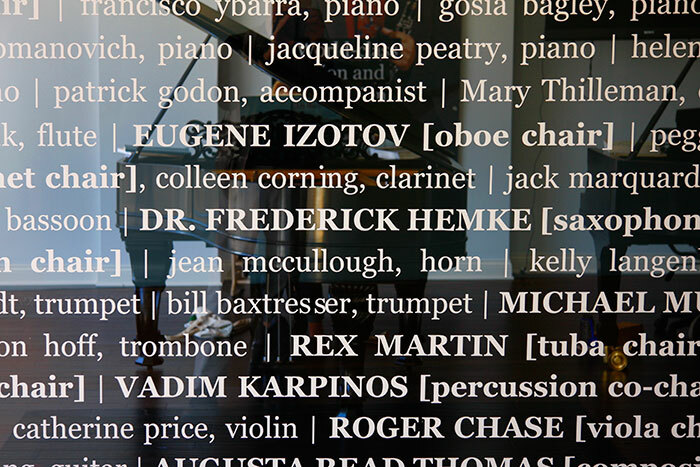 The names of the then current musicians, their orchestral roles and their instruments were displayed in precise typography on sidewalk window glass, set against the grand pianos beyond. Columbia College offers wide ranging tuition in the visual, communication and performing arts to many students. 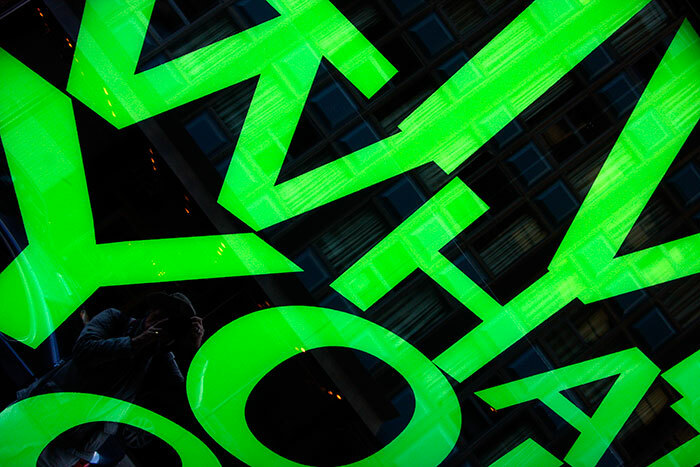 LIVE WHAT YOU LOVE is one of a series of images applied across the large street level window glazing on one of their Michigan Avenue buildings. The phrase is also an integral part of the College website. The abstract graphic possibilities of an angled camera crop appealed. The Chicago Museum of Contemporary Photography is within the College building and its wide ranging exhibitions are open to all. 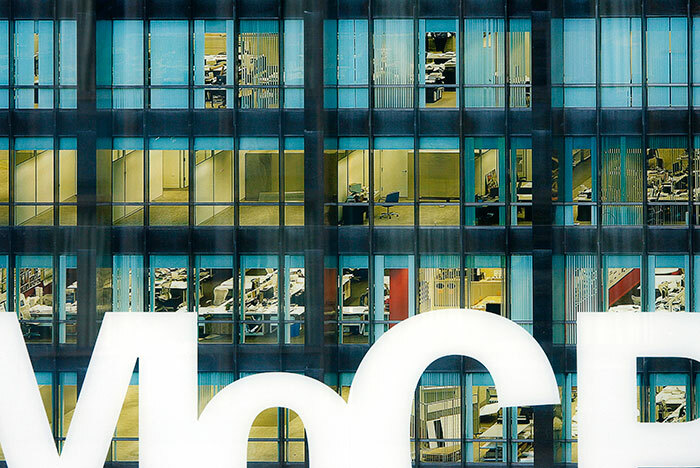 This is a fragment from another street window where the MoCP logo is set against an enlarged architectural image from ‘The Transparent City’ photographs by Michael Wolf. In 2007 he was invited by the Gallery and the U.S. Equities Realty Artists-in-Residence program to photograph the cityscape for an exhibition and a book co-published with the Aperture Foundation. 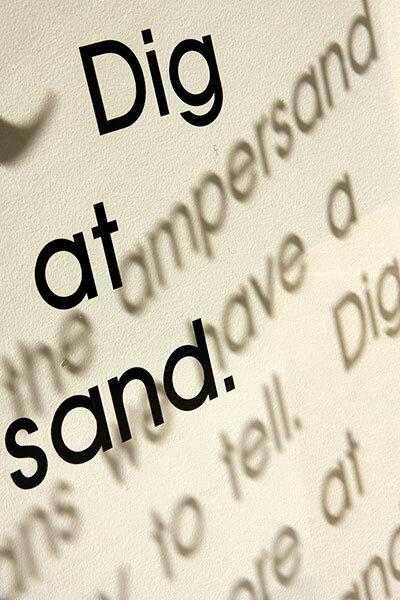 This store on Wabash Avenue continued the adhesive lettering on glass theme with cast shadows as a further dimension. The hand held camera must have slipped a little to crop out letters from the three words shadows. A walk to a specific place passes so many incidentally interesting details sometimes worth more time and consideration. 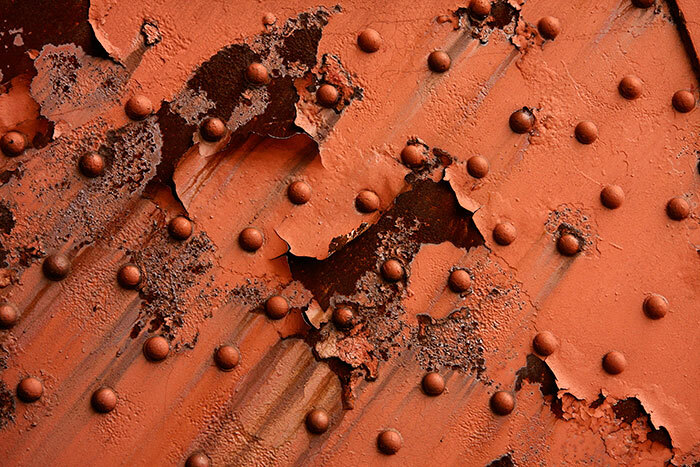 This is one image from a set of photographs recording variations in decaying paint and rusting steel on the uprights of a railroad over-bridge at West Fulton and Canal Streets. Flaking and decay through layers of variously coloured paint layers exposed patches of pitted rust on the steel beneath. Some of pillars carried the remains of red NO PARKING restrictions in their abstract expressionist compositions. 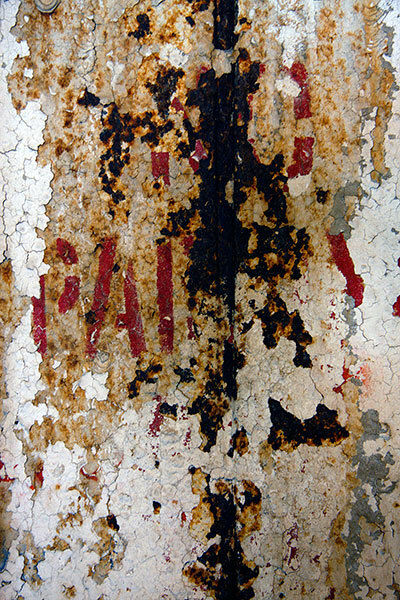 See similar images of painted lettering in decay set in the final gallery: SIGN WRITING – WEATHERED & WORN.